If President Donald Trump wanted a close working relationship with German Chancellor Angela Merkel, he had a funny way of showing it during his presidential campaign. Trump, who will welcome Merkel to the White House on Friday, spent much of 2016 bashing the chancellor, accusing her of “ruining” Germany for allowing an influx of refugees from Syria. Trump may not ask the same question directly to Merkel as the leaders of the Western world’s most influential counties meet face-to-face for the first time. A snowstorm forced them to postpone their plans for a meeting on Tuesday. The itinerary includes discussions on strengthening NATO, fighting the Islamic State group and resolving Ukraine’s conflict, all matters that require close cooperation between the U.S. and Germany, the White House said ahead of the visit. The meeting will be capped with a joint news conference. Beyond the issues, the sit-down could be a restart of a relationship complicated by Trump’s rhetoric on the campaign trail. Then, Trump seemed to care little about the potentially awkward ramifications were he to win. He invoked Merkel as a foil at his rallies, accusing his campaign rival, Hillary Clinton, of wanting to be “America’s Angela Merkel.” He lashed out at Time magazine when it named Merkel “Person of the Year” in 2015 instead of him. But Merkel is used to an altogether different type of American leader, having shared a strong bond with President Barack Obama. She was the last of Obama’s key European allies still in power when he left office. 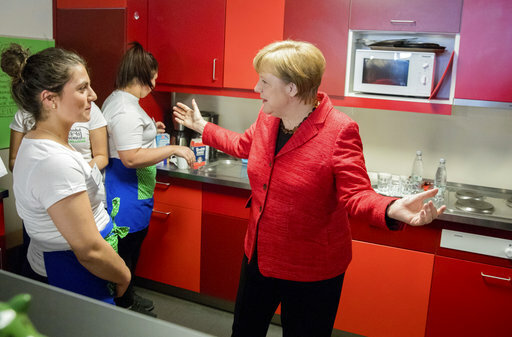 And as the leader of Europe’s biggest economy and most stable government, Merkel emerged in recent years as the leading voice for a continent struggling with slow growth, identity issues and increased security threats after a string of terrorist attacks. Reflecting their connection, Obama and his wife called Merkel and her husband on the day before Trump’s inauguration to thank her for “her strong, courageous and steady leadership.” It was Obama’s final call with a foreign leader, his advisers said. Merkel’s first major encounter with Trump comes as she seeks a fourth term as chancellor in elections later this year. She has acknowledged the contest could be difficult and has stressed a need for stability after Britain’s decision to leave the European Union. She reportedly has studied Trump’s speeches and policies in advance of her trip, eager to find areas for cooperation. Steven Keil, a fellow with The German Marshall Fund of the United States, said Merkel has little reason to dwell on Trump’s past comments. “Merkel is extremely pragmatic in her approach here, but she’s also going to have some situations in which it will be tough for her to give too much,” Keil said. Trump has rattled European leaders with his “America first” mantra. He also backed Brexit and is skeptical of multilateral trade agreements. Merkel is expected to reiterate her belief that a strong EU remains in America’s strategic and economic interests, a message she shared last month in Munich with Vice President Mike Pence. Military matters may be testy. Trump declared NATO “obsolete” before telling European leaders the alliance remains important. But he is expected to reiterate calls for NATO members to meet a minimum commitment for defense spending. Only the U.S. and four other members currently reach the benchmark of spending 2 percent of GDP on defense. Germany lags significantly behind.